Detailing the attributes, habitats, and variations of the Elephpas hypertextus. 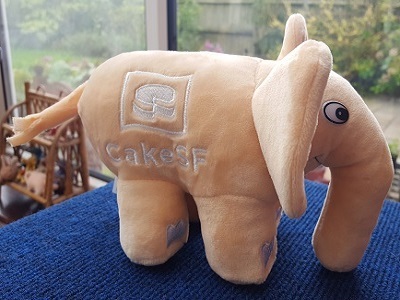 The typical elephpant stands 6" (15cm) tall, with ears that extend above its head, and 8" (20cm) long including its frayed tail. 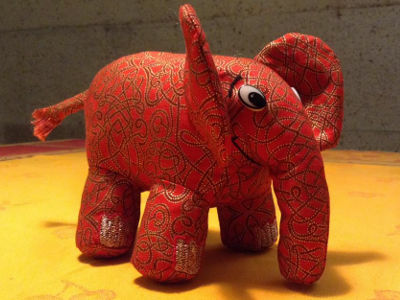 The more rare “jumbo” variety stands 14" (26cm) tall and 20" (51cm) long. It is otherwise identical in appearance to the smaller animals. 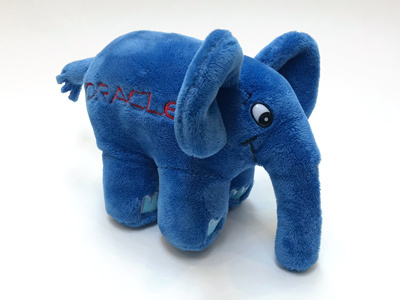 Due to the larger resources needed to procure a jumbo variety, and the increased space requirements for keeping one, they are considerably more rare. 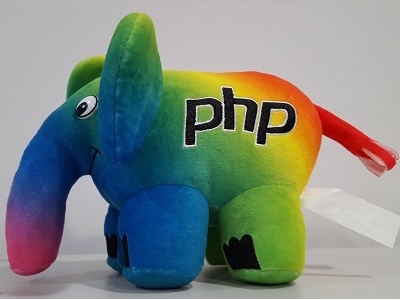 Not all colors have been seen in the jumbo size. The first populations of elephants seen in the wild were blue. This included both the main species and the first few sub-species. Eventually other populations in have been identified in most primary and secondary colors, and new colors are seen in the wild on a increasingly frequent basis. 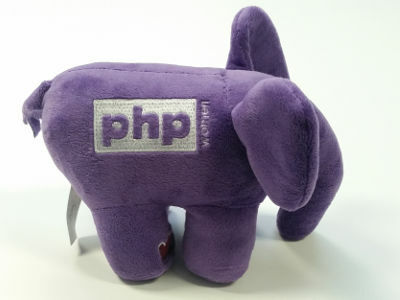 All elephpants have the PHP logo on the obverse (left) side. 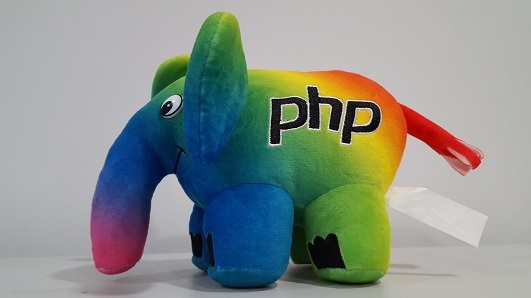 Most elephpants can be identified by color and decoration alone. Sometimes identical animals have been produced over multiple generations. The rear tag is the best way of distinguishing between generations. Sub-species of Elephpas hypertextus are generally identified by different markings on the reverse (right) side. Within the subspecies there may be variations of color. 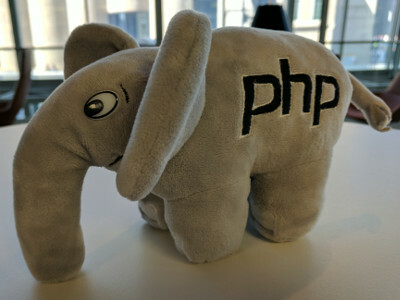 The elephpant's natural habitat is an work environment, and it is equally comfortable in both “corporate” and “home” offices. They tend to form herds on desks or shelves. Children and pets are often highly attracted to the animals. 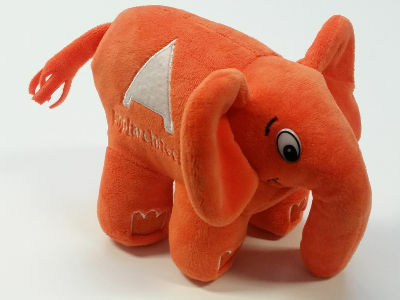 While the elephpant does not mind the attention of these groups, it can be detrimental to the animals' well-being and elephpant owners often keep the groups separated for their protection, unless they have a large herd. 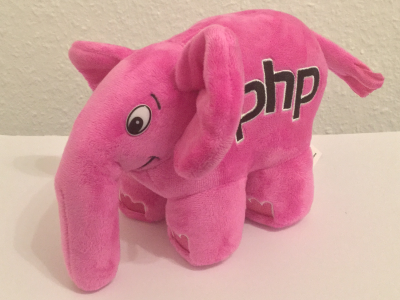 There is no known limit the the elephpant's range. They have been sighted on multiple continents and may be present in all areas of human habitation. A total of 42 populations have been identified across Elephpas hypertextus and 26 subspecies. Sub-species are listed by date of first appearance. Within each group may be multiple populations which differ by color. 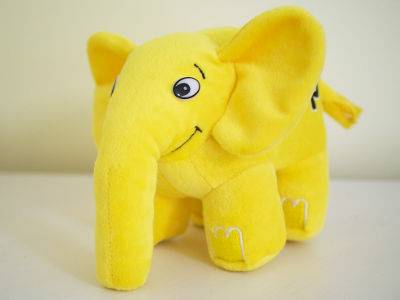 The original plush elephpant. At least six generations were produced over several years by the French company Nexen, which became part of Alter Way. 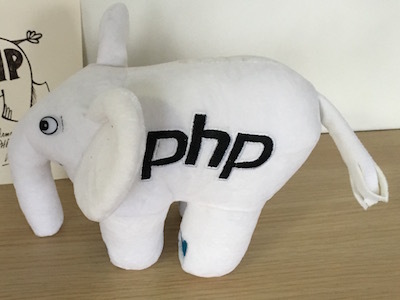 The third photo shows the first elephpant ever produced. 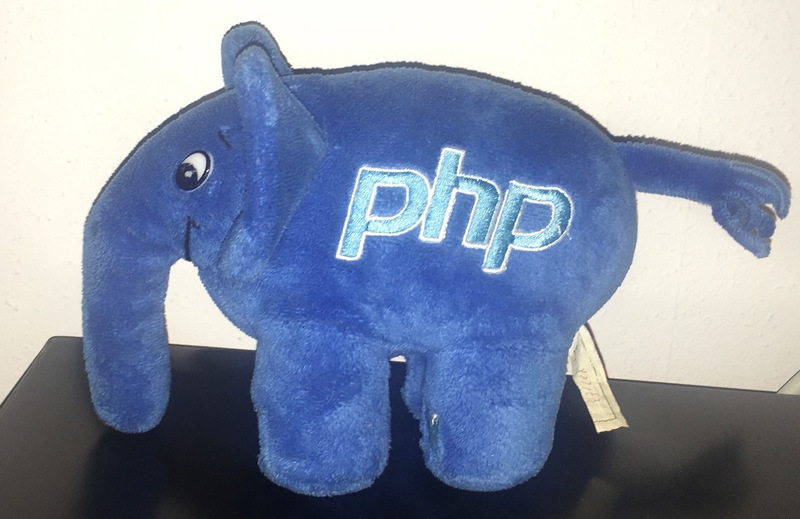 A prototype for the first generation, it has the php logo in a different color. 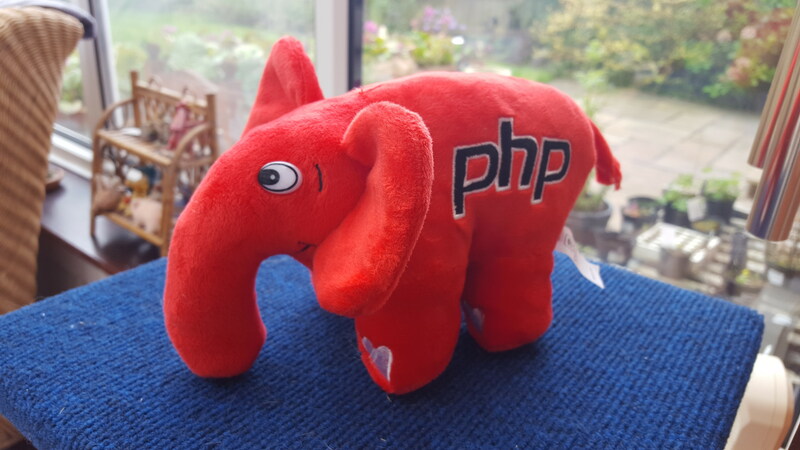 This elephpant is affectionately known as trisaïeul. This was the second color released. 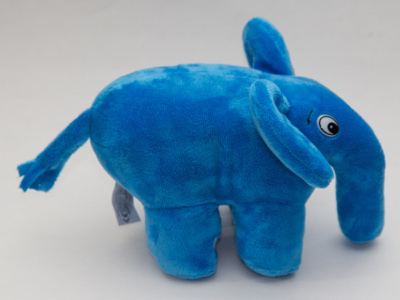 It was produced alongside the sixth generation of "original" blue elephpants. 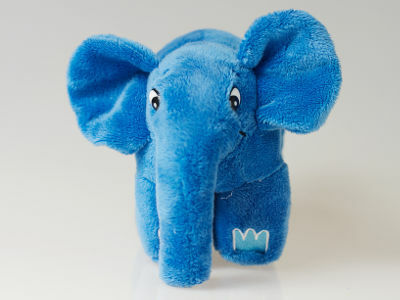 The newest edition of the classic blue elephpant. 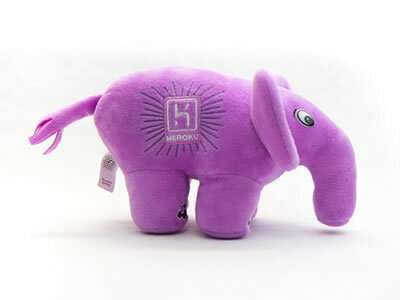 It is produced by OpenGoodies, which succeeded Nexen/Alter Way as the official producer of elephpants. This edition is distinguished from previous generations by the OpenGoodies logo on the rear tag. 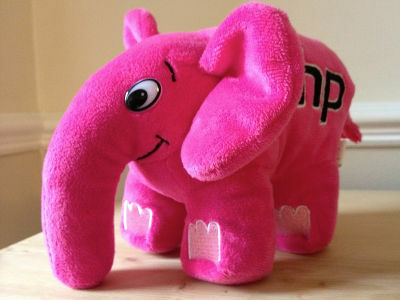 The newest edition of the pink elephpant. 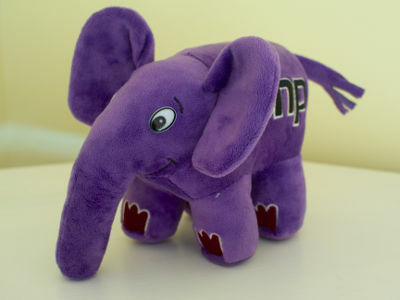 It is produced by OpenGoodies, which succeeded Nexen/Alter Way as the official producer of elephpants. This edition is distinguished from the previous edition by the OpenGoodies logo on the rear tag. 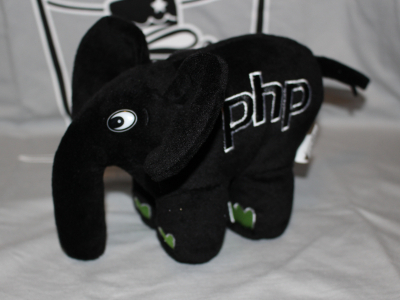 Given to attendees at the 2008 PHP Quebec Conference (now ConFoo), and also to the attendees of the 2008 php|tek Conference (now php[tek]). 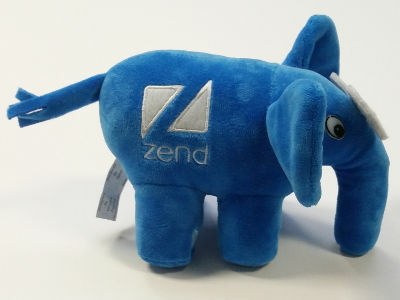 First distributed to attendees at ZendCon 2010. 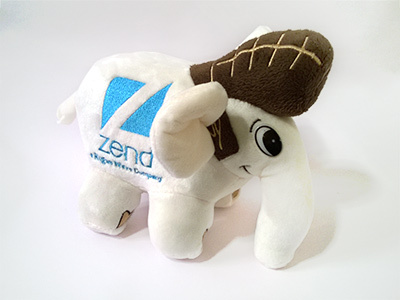 First distributed to attendees at ZendCon 2013. 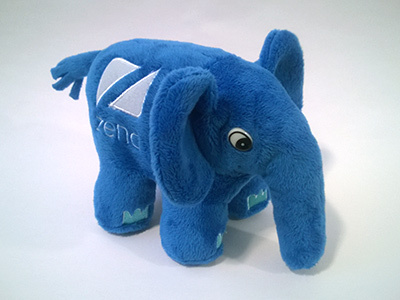 This elephpant was originally intended for attendees at ZendCon 2014. 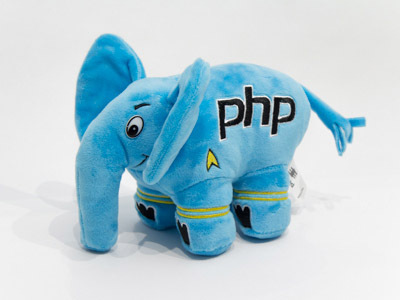 It is based on the Apigility logo which shows a flying elephpant with a rocket strapped to its back. 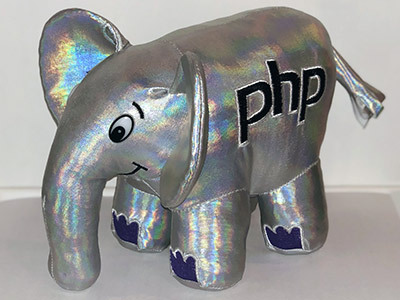 Because it was thought that the elephpant looked like it was firing a rocket, the Z-Ray elephpant was designed and released instead. Only the prototype of this design was created. 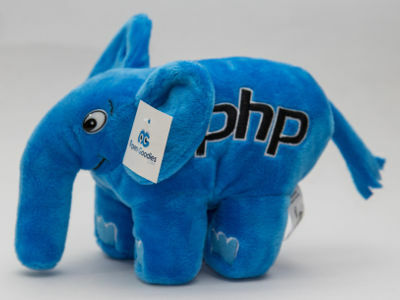 It used a lighter color blue than previous elephpants. 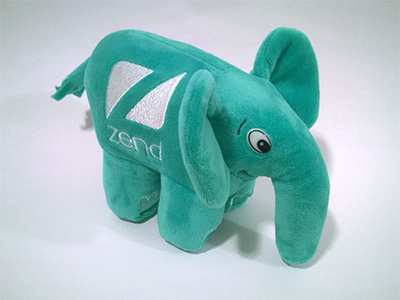 This elephpant was given away to attendees at ZendCon 2014. 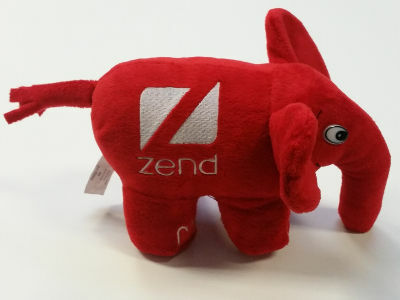 It wears a pair of glasses with red spirals that represent the Z-Ray debugging tool for Zend Server. Also described as turquoise. 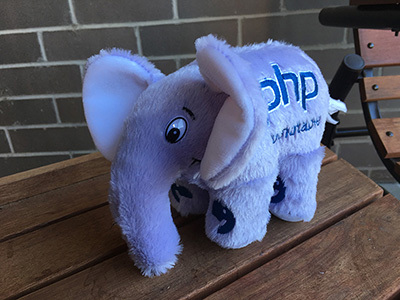 This elephpant was given away to attendees at ZendCon 2015. 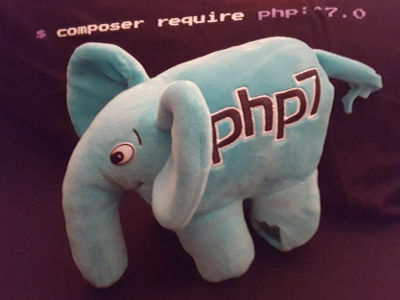 The PHP logo on the obverse has a "7" included to signify the release of PHP 7. 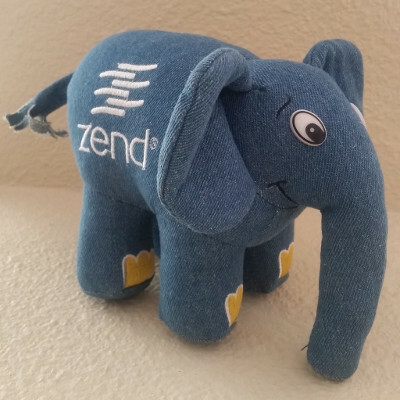 This elephpant was given away to attendees at ZendCon 2016. 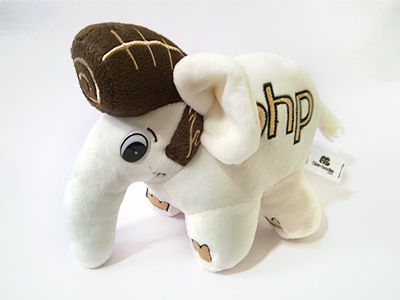 The name ElPHPis was given by the community because of his trademark sideburns. 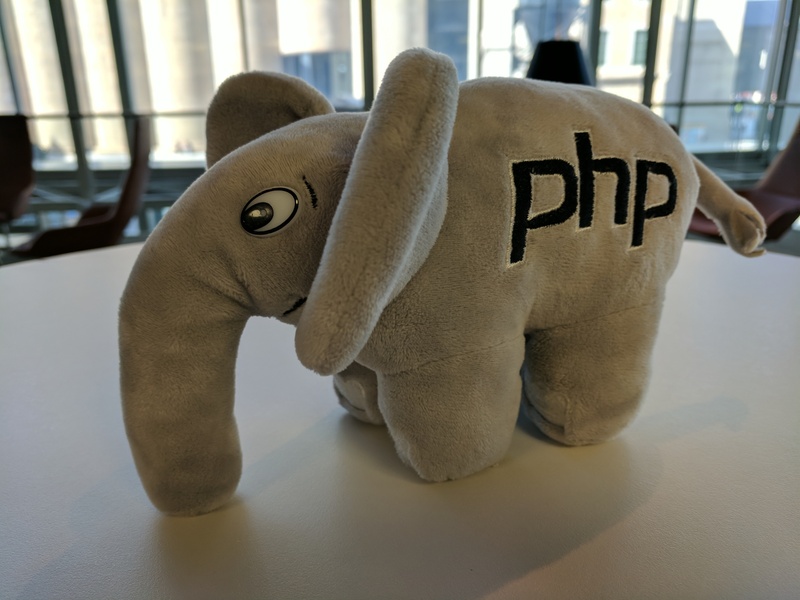 This elephpant was given away to attendees at ZendCon 2017. 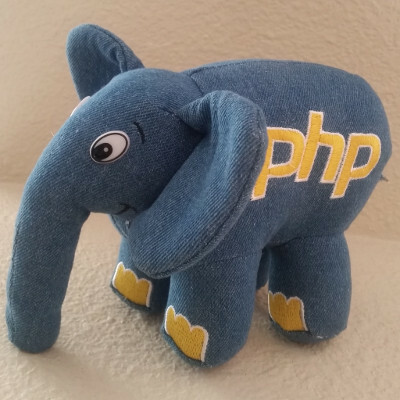 The denim material makes this the first widely-distributed elephpant with non-plush fur. 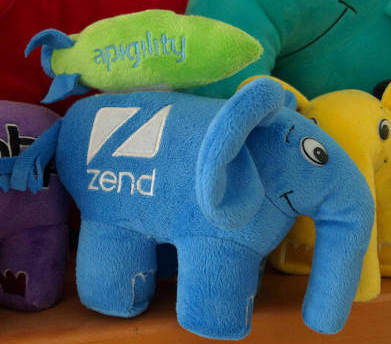 This is the first Zend-branded elephpant to use the Rogue Wave logo. 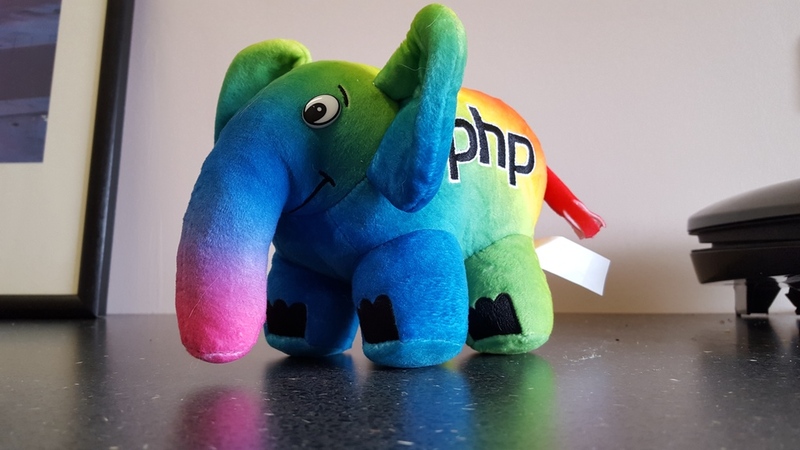 This elephpant was given away to attendees at ZendCon 2018. 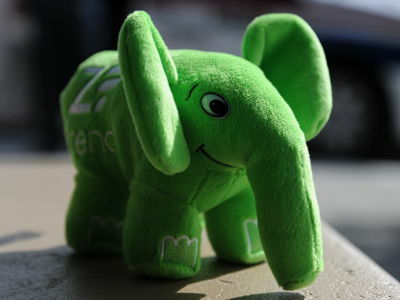 The green color matches the Zend Framework logo. Originally made available through a Kickstarter campaign. 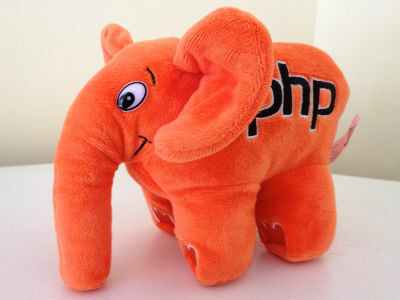 The orange color matches the php[architect] logo. 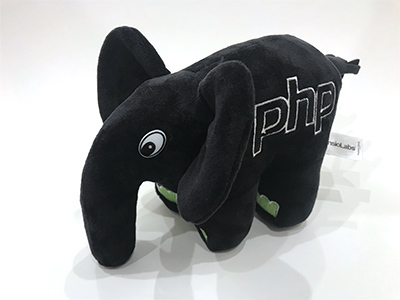 Originally available through a Kickstarter campaign, this elephpant can now be purchased directly from the php[architect] swag store. 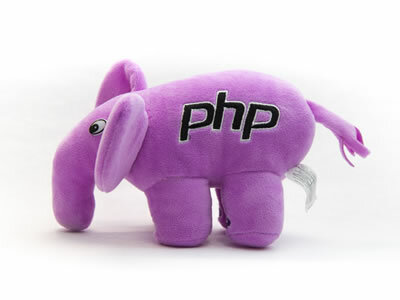 The color matches the PHP Women logo. 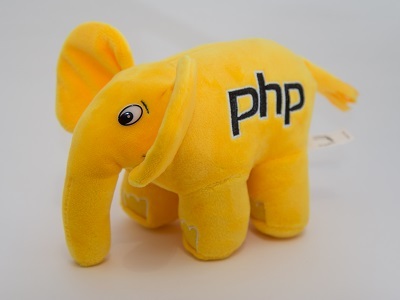 Profits from the sale of this elephpant support PHP Women's programs including conference scholarships. 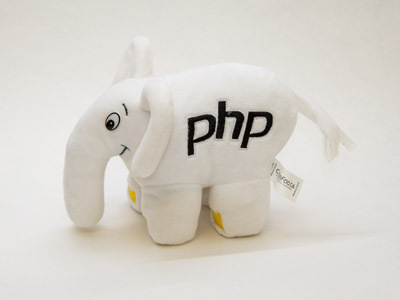 The elephpant was originally designed for the Sunshine PHP Conference. 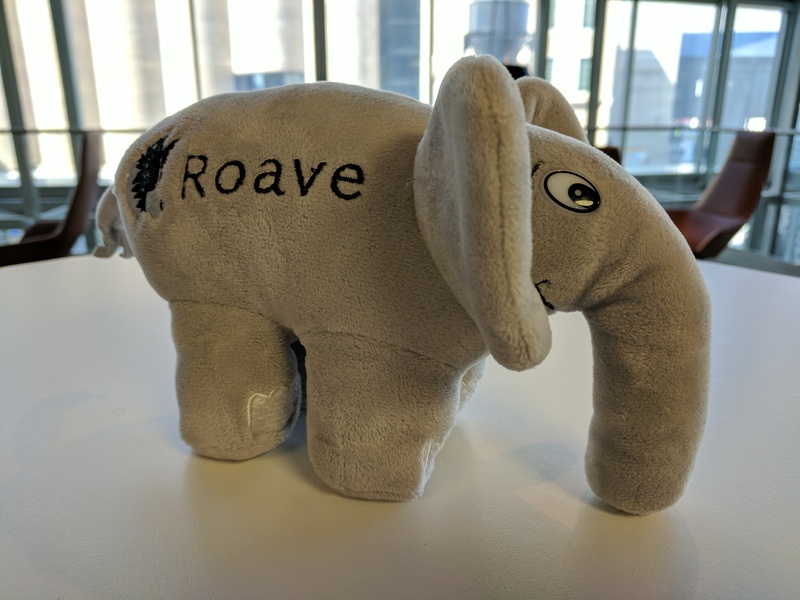 It was given out to attendees at the conference in 2014 and 2015. 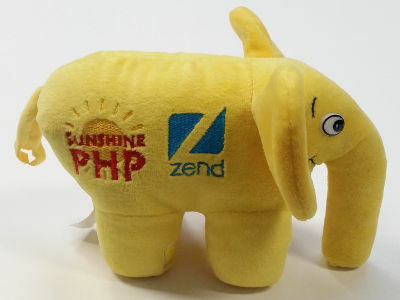 The elephpant is only available to attendees of the Sunshine PHP Conference. 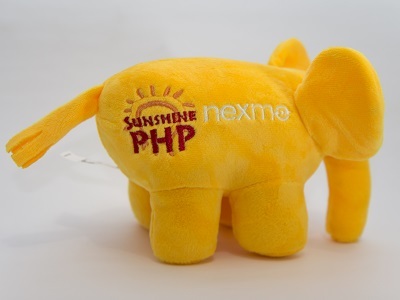 It has a slightly more orange hue than the previous Sunshine PHP elephpant, and the Nexmo logo replaces the Zend logo. 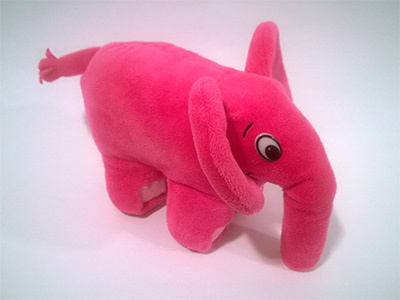 This elephpant was produced via a Kickstarter campaign. 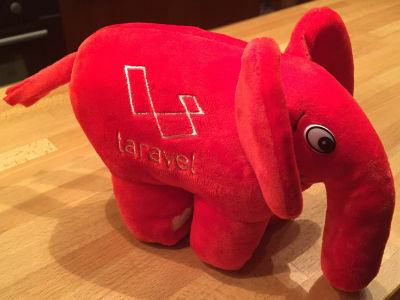 The color matches the Laravel logo. This elephpant was produced via a Kickstarter campaign. 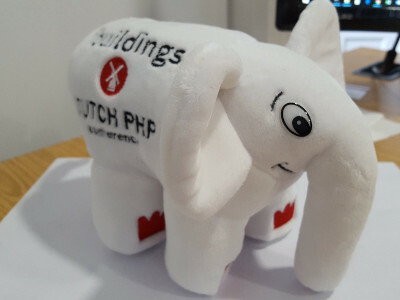 The colors match the AmsterdamPHP logo, which in turn match the flag and coat of arms of the City of Amsterdam. 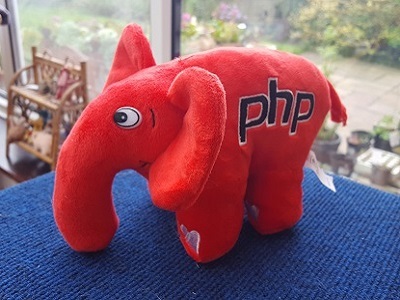 The name MurPHPy was kindly given by the organizers of AmsterdamPHP after facing a multitude of troubles during the packing and shipping stages of the campaign. 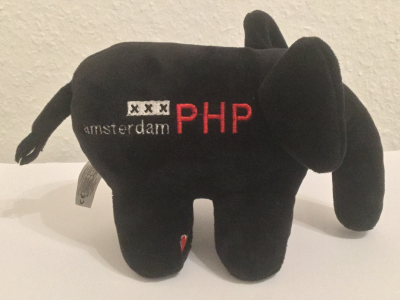 Currently it's available for sale from the the AmsterdamPHP Shop. 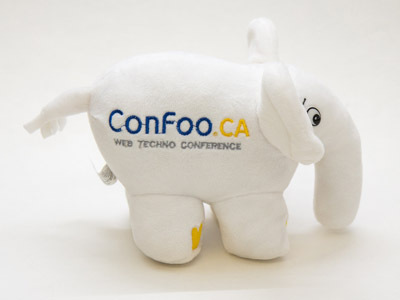 This elephpant was released in 2016 and is available for sale from ConFoo. A true rarity, only one of these elephpants exists in the wild. 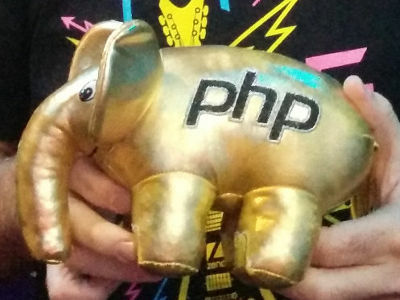 It was designed by OpenGoodies to celebrate PHP's 20th anniversary on June 8, 2015. After developing the prototype the project was canceled because final production would not be ready in time. The single prototype was put up for auction on Ebay on the day of the anniversary. 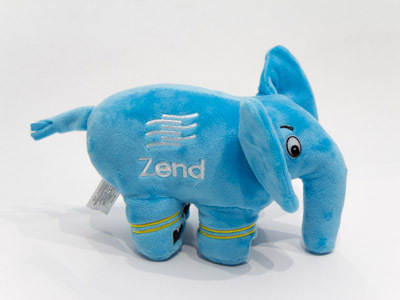 The auction was won by Zend Technologies co-founder Zeev Suraski. 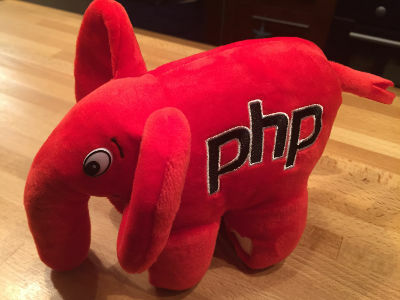 This is the first elephpant that does not have plush fur. 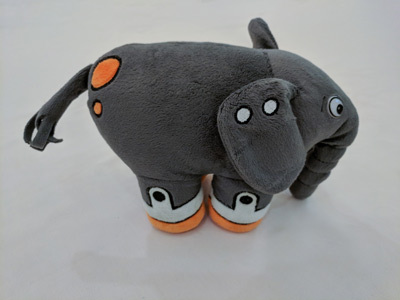 It has a circular disc on the right-rear leg showing the "Official ElePHPant" logo. 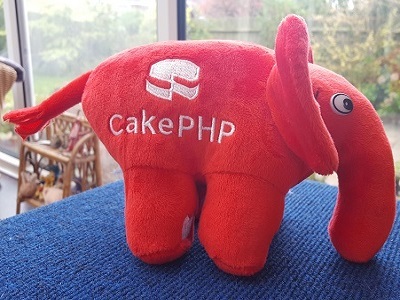 This elephpant has its own Twitter account at @gelephpant. 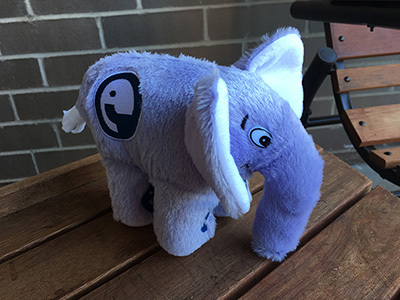 This one-of-a-kind elephpant was handcrafted by V. Fanzutti. 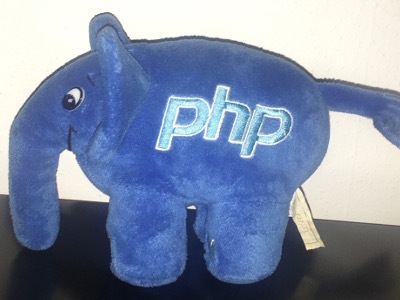 It has been offered to the Kenya PHP User Group for their contribution for the 20th HaPHPy Birthday. 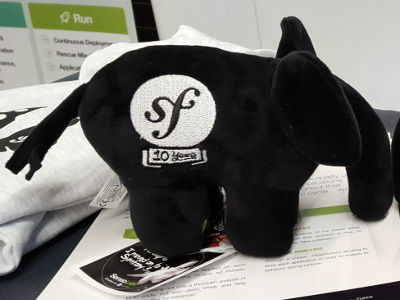 This elephpant was designed to celebrate the 10th anniversary of the Symfony Framework. 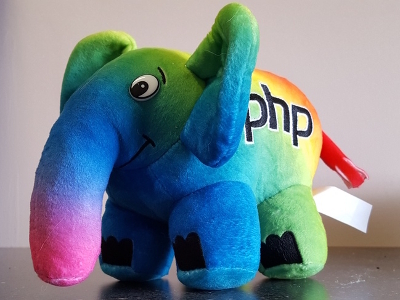 Only 300 were available and were sold exclusively at SymfonyCon 2015 in Paris. 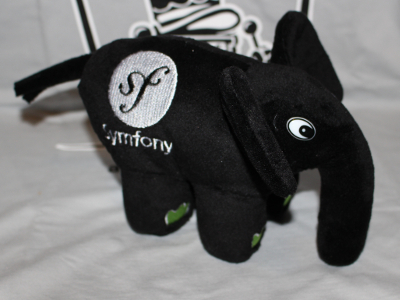 This elephpant has been sold at Symfony-related events starting in 2016. 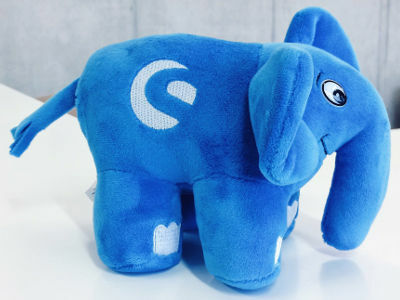 This elephant will be distributed primarily to Shopware contributors and community members. Cody has its own Twitter account at @CodyBlou. 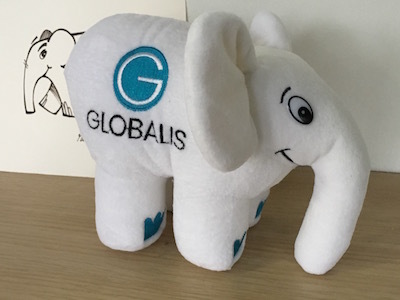 Only 400 small and 5 jumbo-size of these elePHPants were made, and will be delivered primarily to GLOBALIS team members, partners, friends, and customers. 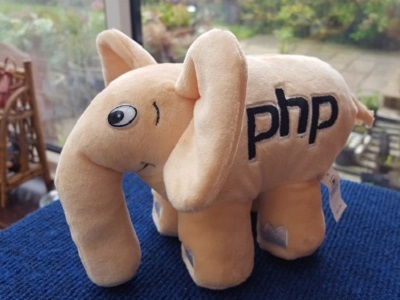 His name, Echo, refers to the PHP echo command and also as tribute to Echo, the famous elephant matriarch who was studied for over 30 years. 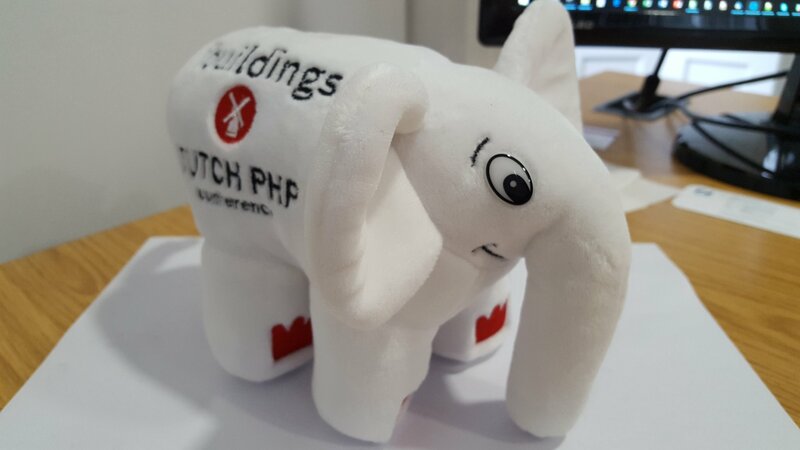 This elephpant was given away to attendees at the 2016 Dutch PHP Conference. 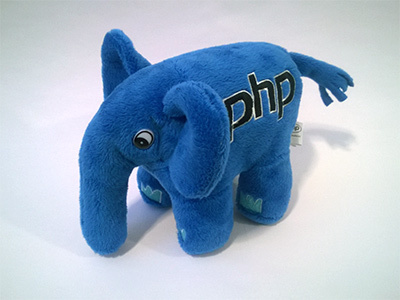 Inspired by a photoshopped image by a Slovenian PHP developer called Peter Kokot. 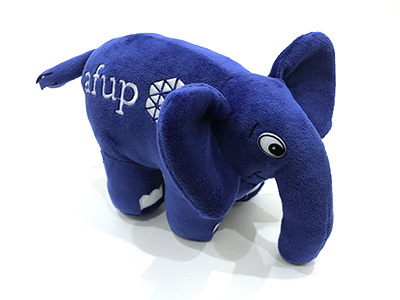 This elephpant was produced via a Kickstarter campaign. 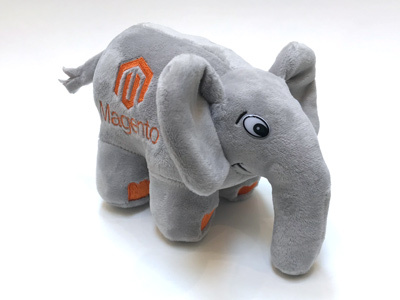 The name Enfys (pronounced EN-vis) is a Welsh name meaning "rainbow", that is gender-neutral; and Enfys is intended to promote Diversity within the worldwide PHP development community regardless of race, gender, sexual orientation, gender identity, age, nationality, disability, religion and technology. 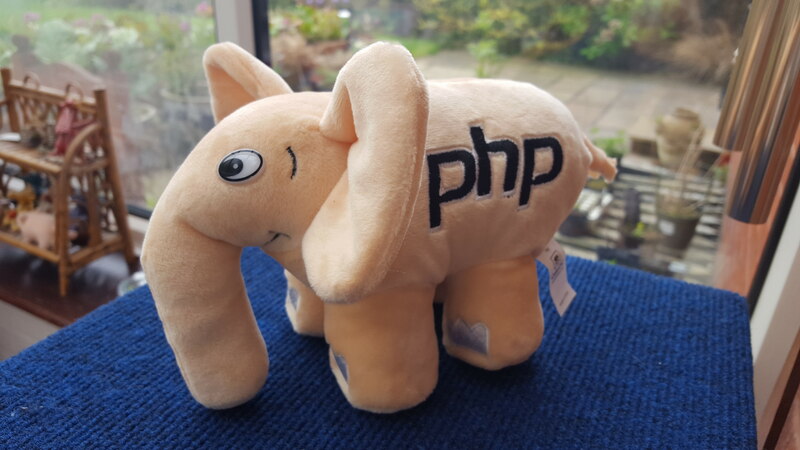 This elephpant was released in 2017 at AFUP's annual Forum PHP conference. 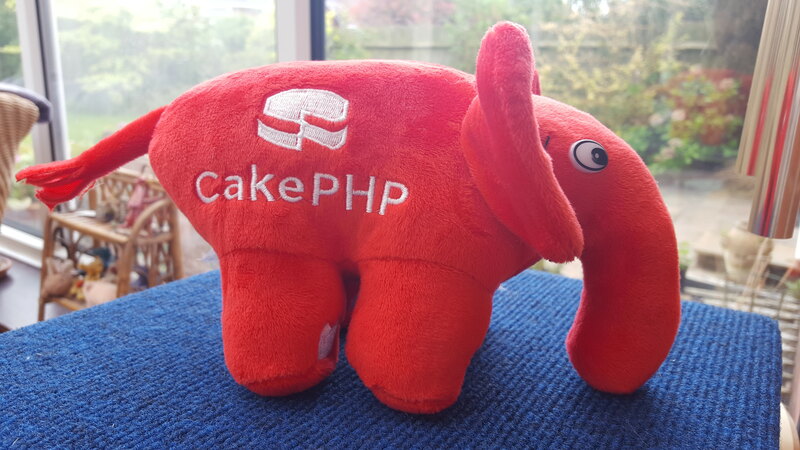 This elephpant is available to CakeDC's clients and at events that CakeDC sponsors. 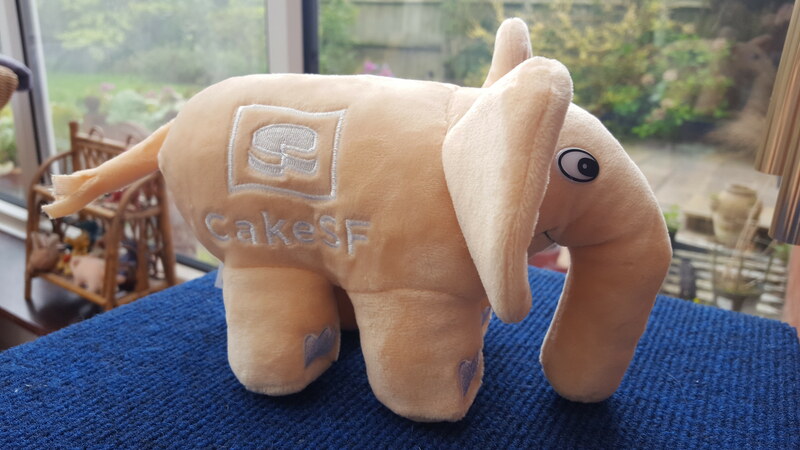 Announced at CakeFest 2017, these will be made available to future CakeFest attendees. 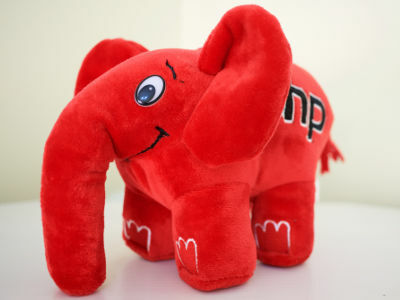 This elephpant has cloud-shaped toenails. 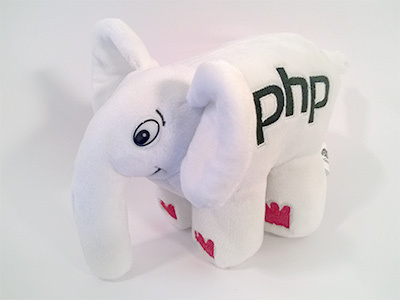 The first and only elephpant created for a PHP Podcast. 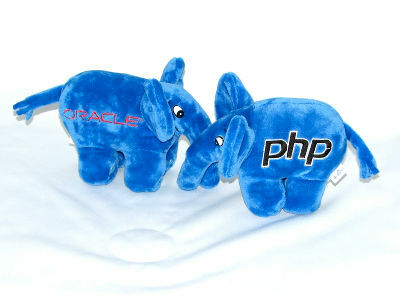 It's fuzzier than standard elephpants and sports nifty logo nails and white feet pads. Only 500 were made. 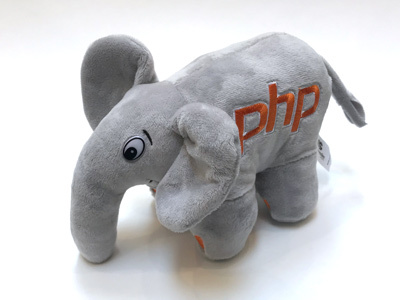 This elephpant is currently available for sale at PHPRoundtable.com. 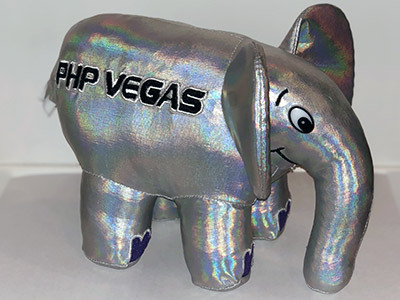 This elephpant was designed by the PHP Vegas user group. An Indiegogo crowdfunding campaign was run produce it. However, it did not hit its funding target and the prototype remains the only one of this subspecies in existence. The name PHPlashy is an ode to the lights and glamor of Las Vegas, NV. 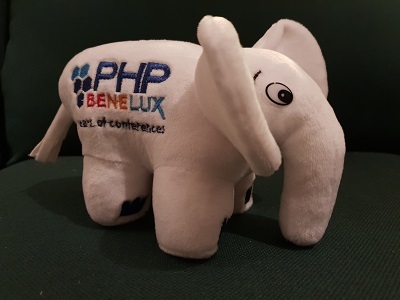 PHPBenelux Conference logo/"10 years of conferences"
Several animals that are similar to elephpants, but cannot be catogorized as such, have recently been seen in the wild. 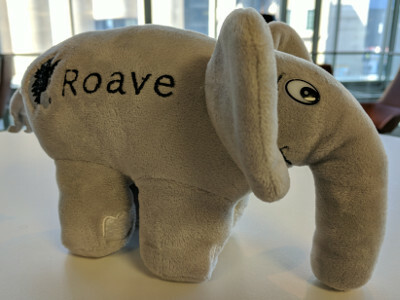 This animal has smaller ears than an elephpant, and tusks. 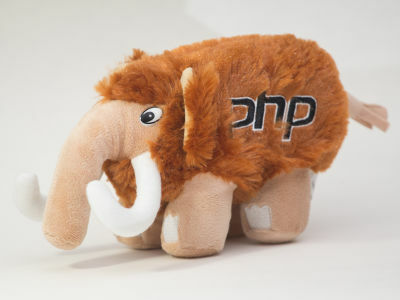 The body of the mammoth consists of both plush fur and longer hair. 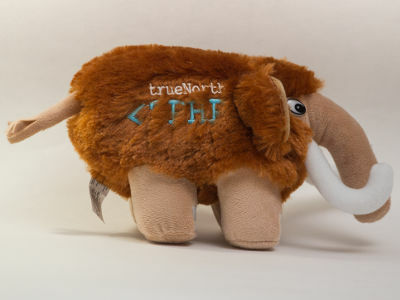 The woolly mammoth was produced as a giveaway for the 2015 TrueNorth PHP Conference in Toronto, Canada. A Kickstarter campaign was held to help fund the giveaways. 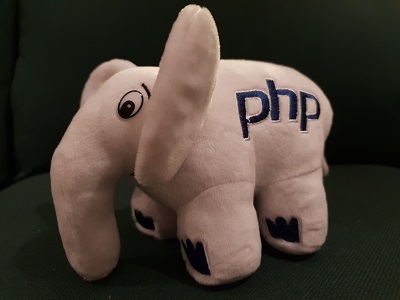 Due to a production delay, the mammoths were not available in time for the conference and were instead distributed to TrueNorth PHP attendees primarily through meetups in and around Toronto. 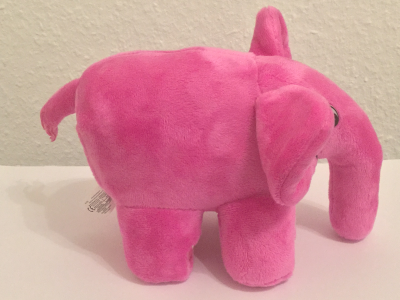 The mammoths were released and started shipping to Kickstarter backers in January 2016. 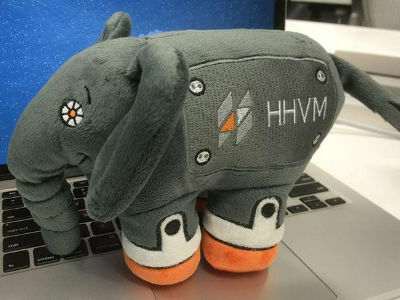 Produced by the HHVM/Hack team at Facebook. It has not been released publicly. 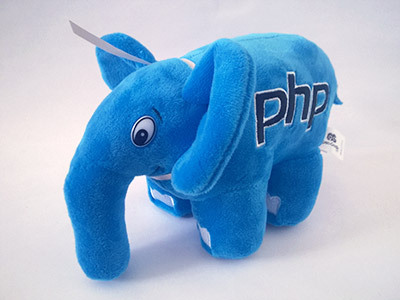 It has a HHVM logo in place of the PHP logo. Three prototypes have been produced followed by 500 which will not be available for sale. 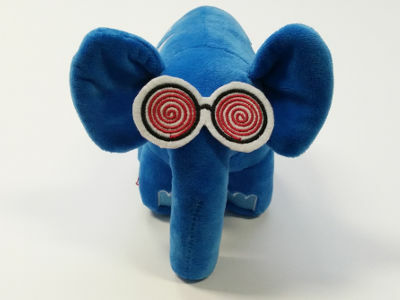 The pHackyderm has several features that distinguish it from an elephpant including an articulated trunk, robotic eye, and boots. 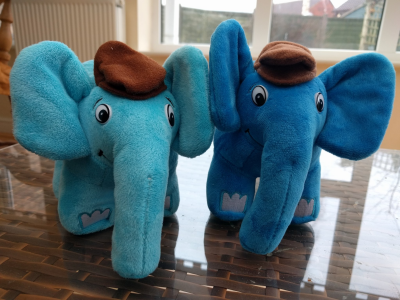 The first prototype is named Steve, and the second Steven. All have the HHVM plate on the obverse side. The initial prototype has a blank reverse, but the later protypes and production pHackyderms will have the Hack logo and text on the reverse side. All photographs are credited to their original authors. For other contributors, see GitHub. Contributions to the content, style, and structure of this publication are welcome. To contribute, please see the CONTRIBUTING.md file in the GitHub Repository. This publication is typeset in Old Standard TT, which is loaded from Google Fonts. The text of this publication is written in Markdown. 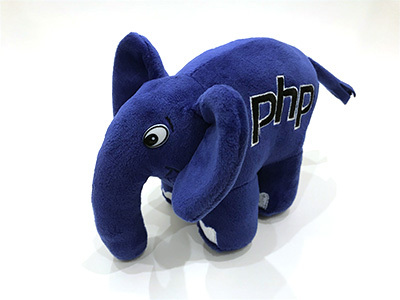 The layout is written in HTML and and styled with CSS. 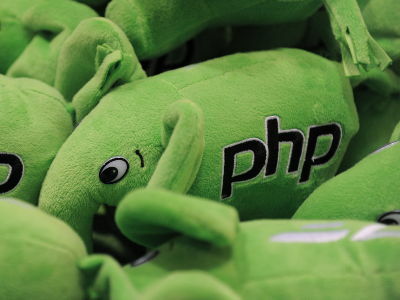 The sources are stored in a Git repository and hosted at GitHub. Final assembly is performed using Sculpin. 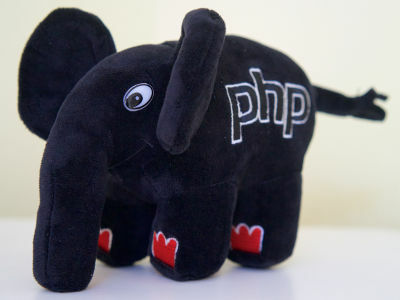 The publication is hosted on GitHub Pages. © 2015-19 Philip Sharp and contributors. 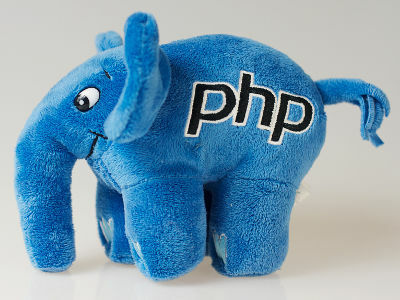 Elephpant logo by Vincent Pontier. The content of this website is licensed under the Creative Commons Attribution-NonCommercial-ShareAlike 4.0 International License.